Two years ago I travelled up to Stirling, only a couple of days after arriving in the United Kingdom to start a new chapter. It was a spontaneous trip to Scotland for the Bloody Scotland festival. I discovered a lovely, historic town, and a fantastic crime writing festival. It was a wonderful trip - I caught up with several authors I'd met and interviewed in the past, either when they'd visited New Zealand or when I'd gone to my first-ever Harrogate while over in the UK for a mate's wedding a couple of years before. It was great to see the likes of Denise Mina, Mark Billingham, Ian Rankin, and Stuart MacBride and others. Fantastic writers and fun people. I also met a plethora of new-to-me authors, many of whom I've since had the pleasure of catching up with multiple times while living in the UK for a couple of years. As well as reading their books. It was at that first-to-me Bloody Scotland where I met the likes of Luca Veste, Kati Hiekkapelto, Ragnar Jonasson, Howard Linskey, Douglas Skelton, Parker Bilal, Neil Broadfoot, Alex Sokoloff, Ed James, Caro Ramsay, and Eva Dolan (among many others), along with organisers Lin Anderson, Craig Robertson, Alex Gray, and Gordon Brown (not the Prime Minister), and publisher extraordinaire Karen Sullivan. Festivals are about storytelling and the celebration of the power of words, but they're also (mainly) about the people. The authors and readers, gathered together. In a weekend jam-packed with good times, one of my highlights of that 2014 edition was getting to meet and have a drink with William McIlvanney, the doyen of Tartan Noir. His son Liam had just won the 2014 Ngaio Marsh Award for Best Crime Novel at the WORD Christchurch Festival a couple of weeks before, so we had a nice chat about that, among other things. Sadly, Willie didn't make it to Bloody Scotland last year due to illness, and later passed away. As we say in New Zealand, 'a mighty totara has fallen'. I was very pleased to see that they have now renamed the Scottish Crime Writing Award the McIlvanney Prize, a fitting tribute to a man who led the way for his crime writing compatriots. And today, a panel of judges chaired by Magnus Linklater, have revealed the four finalists for The McIlvanney Prize from a ten strong longlist featuring some of the best names in Scottish crime fiction. The finalists include two leading crime writers – Val McDermid and Chris Brookmyre – who the judges praised for keeping their established series fresh, with contemporary themes which are immediately relevant to society today. In addition, Doug Johnstone, with a stand-alone psychological thriller and E S Thomson with an atmospheric historical crime novel, the first in a planned series, have made the cut. 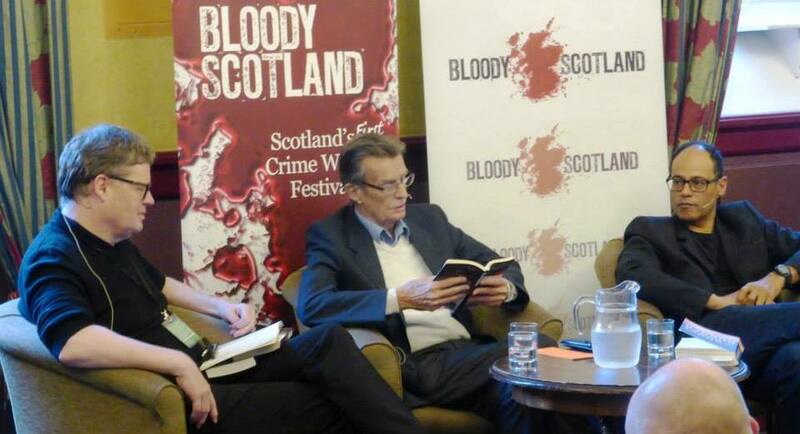 The winner of the Scottish Crime Book of the Year will be awarded The McIlvanney Prize in memory of William McIlvanney at the opening ceremony of Bloody Scotland. His brother, Hugh McIlvanney OBE, will travel to Stirling to present the award on Friday 9th September. The winner will receive £1000 and all four finalists will be presented with a full set of William McIlvanney novels. BLACK WIDOW by Chris Brookmyre - this novel is like watching Olympic diving – just when you think the plot can’t twist again, it takes a new turn. Even the twists have twists. With a theme of cyber-abuse, this shows an author taking a long running series to new heights. THE JUMP by Doug Johnstone – a taut psychological thriller with a powerful and absorbing narrative which makes this work a compelling read. The reader is drawn into a family drama, suicide, murder -- and a plot whose outcome remains nail-bitingly unresolved until the final pages. SPLINTER THE SILENCE by Val McDermid - set in a totally believable world of internet trolling, this novel features established characters but moves their relationship into a new place, suffused with longing. Easily accessible, even to those readers who have not been introduced to earlier books in the series. BELOVED POISON by ES Thomson - an ambitious and original novel, full of vivid historical detail about Victorian medicine, and a richly gothic atmosphere, with a large cast of wonderfully named characters, including the strong lead character. All four authors will be at the presentation. They will also be appearing in various events at Bloody Scotland during the weekend. For further information please contact fiona@brownleedonald.com.